No matter how beautiful the hand-crafted jewelry, candles, soap, or greeting cards, they need to be marketed well in order to make a profit. 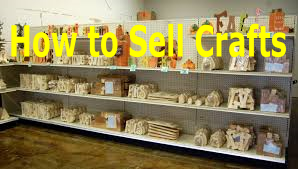 A good wholesale client, such as a gift shop, can keep crafters in business if those artisans are willing to work hard enough to meet the store’s demand. The first test of a marketable product costs very little. Scope out the gift shops and stores in the area that are likely candidates for resale. Put together some samples, and print out some cards with contact and pricing information. First, ask if the appropriate buyer is available. The person may be present and available. Show her samples and price lists, and do explain why these items will sell well in her store. In the best case scenario, she buys them on the spot. If she is not available, leave a sample, contact information, and price list, and take the buyer’s business card. Instead of leaving a sample, it is acceptable to ask the shop employee whether it is best to call first or mail a sample. In any case, follow up with a phone call in a week. Remember stores are busier on weekends. Always market products during regular business hours, Monday through Friday and 9 a.m. to 5 p.m. Craftspeople and sales representatives are most welcome when there are few to no customers in the store. Dress like a professional when visiting shops with samples. Looking “artsy” in painting overalls will not make a good impression. Looking clean and professional will. If a craft has successfully sold to local gift shops, and at least one gift shop has placed a second order, it is time to expand the markets. Take high quality photos of the hand made jewelry, soap, or crafts. Print out a simple brochure and price list. Look up businesses around the country that would be able to sell these items. Family and friends in other places are good sources of information. Call businesses and ask for appropriate contact information. Mail out the brochures, and make follow up phone calls in a week. While expanding markets, remember to take new clients on slowly, not all at once. Crafters and artists need a reasonable amount of time to purchase supplies, craft items to order, and mail them out to clients. Calculate the costs per item. For example, if the supplies for one pair of earrings cost $1, then the wholesale price will be $2. Wholesale is the price charged to shop owners to resell the items. Expect the retail price to be twice the wholesale price, or in this example, $4. Make payment arrangements when people place orders. One option is to require upfront payment, other options include net 10 or net 30. With net 10, the buyer has ten days to pay. With net 30, thirty days. Persevere and have a thick skin. If some people say “no,” and some people say “yes,” focus on developing relationships with the latter. Utilize constructive feedback received, it can help.